It isn’t often that we see a stage family that gets along. Recently, we’ve seen the Goodmans in Next to Normal throw things at each other (OK, maybe only Alice Ripley does), and the Gordons of Dividing The Estate are at each others’ throats, as are the Westins of August: Osage County, literally. 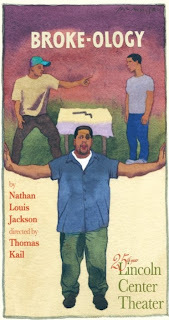 That the King family in Broke-ology is so close and jovial contributes to the warmth that emanates through this play by Nathan Louis Jackson. But hey, I didn’t say they were free of problems. This Lincoln Center Theater production finds Malcolm (Alano Miller) returning home to his brother and father in Kansas City, Kansas, just after completing his master’s degree and securing a local job for the summer at the Environmental Protection Agency. His blue-collar father and restaurant-employee brother are both happy for his achievements, and even happier that he’s home. Both are in need of his aid, and assume Malcolm’s summer job means an indefinite stay. Patriarch William (Wendell Pierce) is suffering from multiple sclerosis, and the homebound son, Ennis (Francois Battiste), is his caretaker. Ennis also has a pregnant girlfriend, and it doesn’t take long to see that he is stretched thin by his responsibilities. Malcolm is wrecked with guilt, torn between his needy family and even higher career aspirations tugging at him from Connecticut. This family has a lot of obstacles to overcome. Ennis describes his current study of life as “Broke-ology,” the study of being… well, you know. But despite their problems, the Kings show a tender, jocular affection for each other that translates breezily from Jackson’s words. Even the brothers’ most intense moments of conflict don’t hold too much drama, because they don’t stay mad for long. In fact, this might restrain Broke-ology from ever becoming too intense. Although Jackson’s play might lack heightened theatrical “drama,” it succeeds in portraying the drama of real life. Watching a loved one slowly slip away is a fearsome reality that most people face at some point in their lives. A month ago, my grandmother suffered a massive stroke, and my family and I are currently playing out our own version of Broke-ology. It’s a painful road, and as someone walking down it, I felt this play dealt with it honestly and gracefully. The focus of the play is on the two brothers and their conflict. Battiste and Miller are both charming and adept; but it’s Pierce who steals the show and breaks the audience’s heart. William is ashamed at his reliance upon his sons, yet doesn’t display it in overly dramatic ways—even more gut wrenching. Parts of the play revert back to William’s wife Sonia, who died of cancer when Ennis and Malcolm were young. The opening scene shows Sonia and William cuddling on the couch, musing about all the hope they have for their future family. We learn that their plans never work out, and when Pierce reflects back on his wife, and in a later scene talks to her as if she’s there, the moment is heavy enough to crush the house. This element of Broke-ology brings to mind the tragedy that Next to Normal explores—the unforeseen and uncontrollable events life presents. The role of Sonia, as she has one scene in the present and other scenes as a vision, feels like an idea not fully developed by Jackson. But Crystal A. Dickenson plays her with huggable sweetness. Yet with these themes developed so well, I realized the play’s title is a misrepresentation. The Kings each feel trapped in their own ways due to lack of funds. Ennis and Malcolm can’t afford to put their father in a quality care facility, nor do they have the opportunity to care for him full time. But if Jackson wanted the theme of “Broke-ology” to carry the play, he would have placed the Kings in a more destitute situation. I know the Kings have financial problems, but they didn’t come across as serious enough as to warrant the title of the play. The Kings’ financial situation is reflected through their living room, designed with delightful warmth by Donyale Werle. They live modestly, but their living room reflects the love that their household saw during their childhood. Werle’s set looks like the Conners’ from Roseanne moved out and left the house fully furnished. The room looks so lived in and cozy that I wouldn’t have minded curling up on the couch with a magazine. There were many details that I’m sure aren’t even visible to most of the audience, but in this case, no detail is in vain. Broke-ology isn’t the heaviest of family dramas and doesn’t break new ground. But it’s notable for its portrayal of a loving family, that doesn’t stop doing so through their conflicts. It’s also a sobering reminder of how unforgiving life can be. Editor’s note: I was invited to see Broke-ology and did not rush it. There is a student rush policy for the show. Tickets are $20 each and go on sale two hours prior to the performance. One ticket per ID.